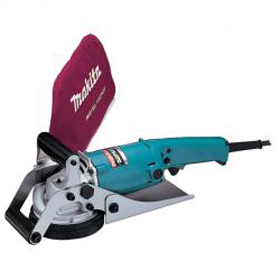 This concrete planer gives you smooth finishes on concrete surfaces and levels concrete seams with precision. It features a dry cutting diamond wheel for planing without a water feeding system. Adjust planning-depth quickly with the front roller. Keep surfaces clean with the handy dust bag on this tool. For extended use just click the lock-on button. This tool is double insulated for longer tool life. Your hire includes a diamond wheel,which is chargeable as an exta a steel tool case, the dust bag. Dry cutting diamond wheel for planing without a water feeding system. Front roller adjusts planing depth. Dust bag for clean operation. Lock-on button for continuous operation.